Try as hard as you might, nobody can put their finger on just what art does and means to the world. For some, it is an essential divide between our primitive counterparts, for others, an honest expression that words can’t fathom. However, no matter where your ethos lie, art can always be pinpointed to the uncontrollable force of time. Either capsuling or looking toward the future, the power of art is measured in its longevity by both impact and influence. 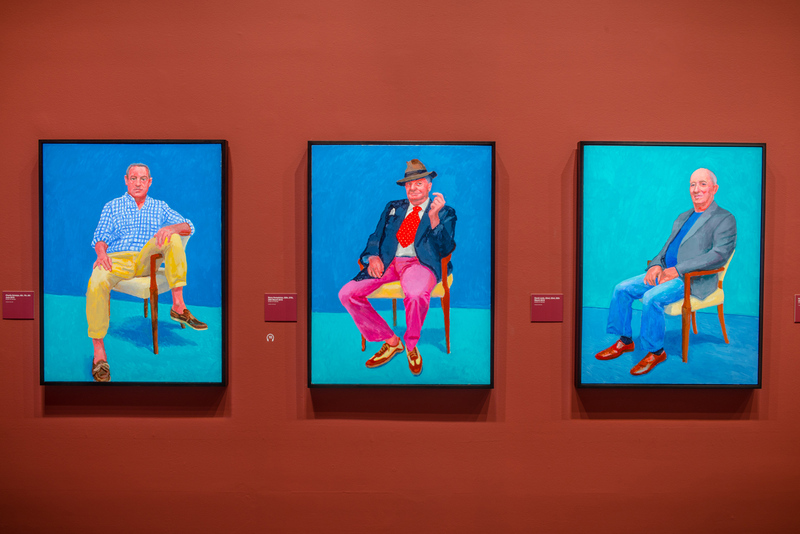 For their latest major exhibition, The National Gallery of Victoria has invited seminal English painter – David Hockney, to present a collection of work pulled from the artists studio. Part retrospective, part new collection of work: Current – stands as a living breathing display that crosses many paths, through the evolution of technology and the artists own revolving progression in his form. 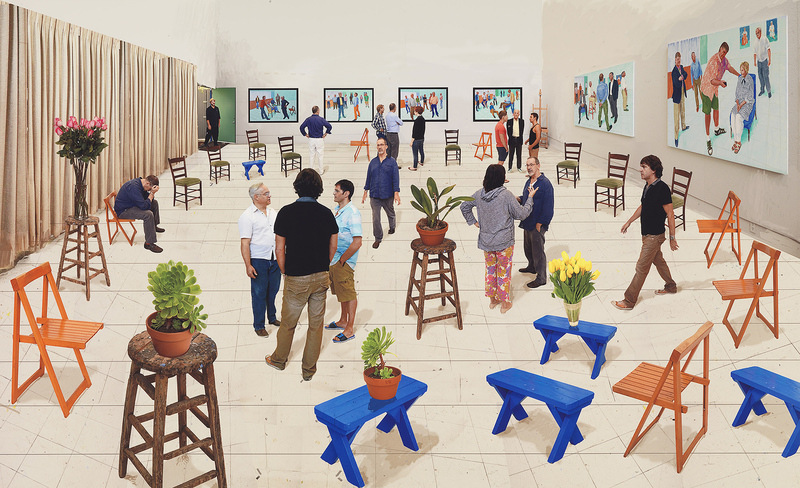 Collecting over 600 pieces of brightly engaging art, Current holds questions of time and place, in a world where the present is an overthought in the past and future. 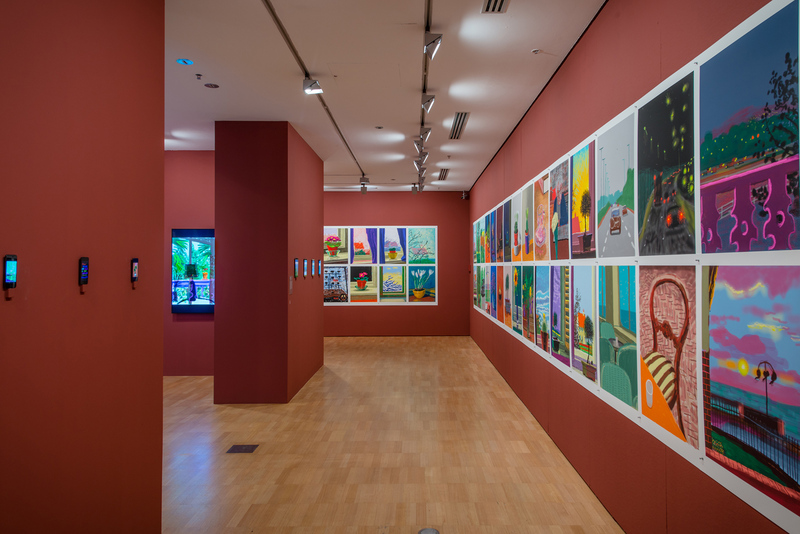 Opening with Hockney’s most recent use of iPad’s, iPhone’s and the Brushes app, Current welcomes visitors with an inspiring visual display. 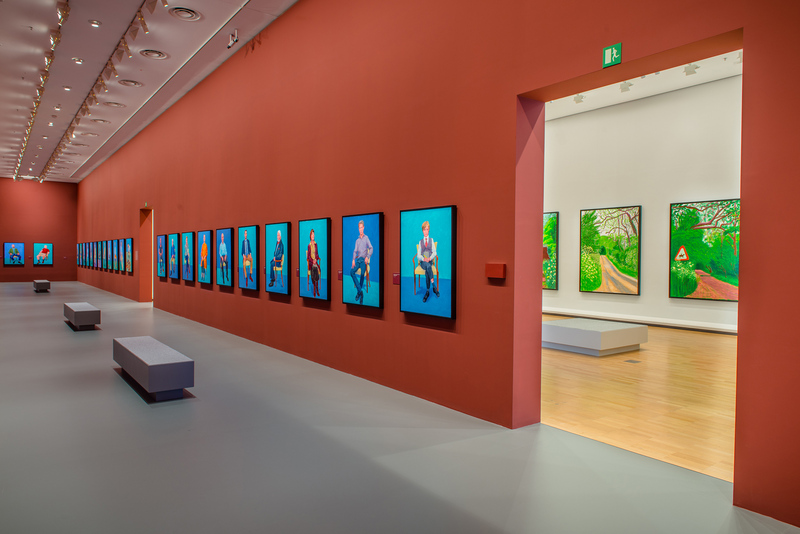 This warm embrace of contemporary tech covers over 40 LCD screens as they show feverish time-lapses compiled during the many hours Hockney spends painting on the unorthodox canvas. Brightly lit and teeming with colour, the display could equates to substantial amount of time spent in it’s creation alone with well over 100 pieces on display. Viewable from many angles, Hockney’s adoption of these tools struck me during the display, as I sat there scribbling notes into a pad, trying to de-modernise myself from technology bit by bit, all the while – Hockney continues to paint, communicating with only a brush. Moving onward from the digital landscape, viewers are subject to lush natural scenery, as decaying Autumn colours replace the neon-like movement set previously. Decadently dark trees hover the foreground, as the more lively haunt their demise, drawing your eyes into it’s overcast countryside. Like a portrait of his visual DNA, the display evokes both nostalgia and a gaze into the future, surrounding us at ever glance. 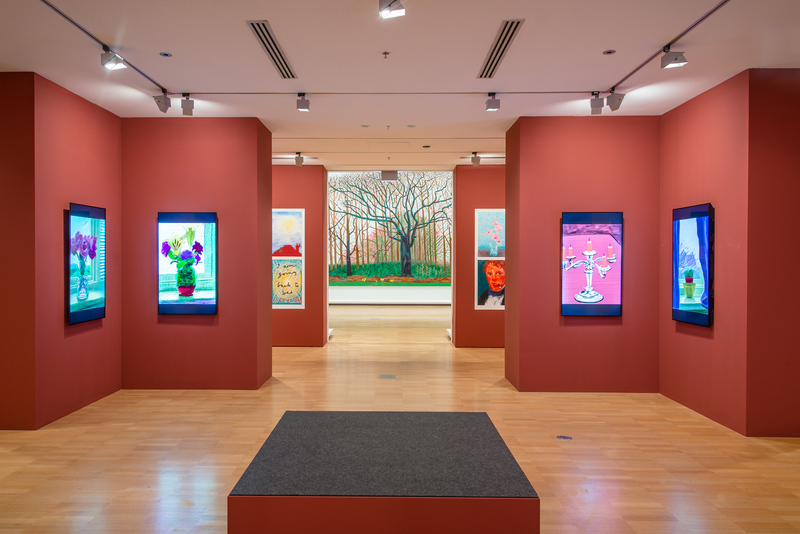 A tall lone tree stands in the adjacent space, bringing new life into the ongoing display as the bright, digitised works (similar to those shown previously) invade the display, reprinted at a larger scale, like an inviting fountain of natural youth. 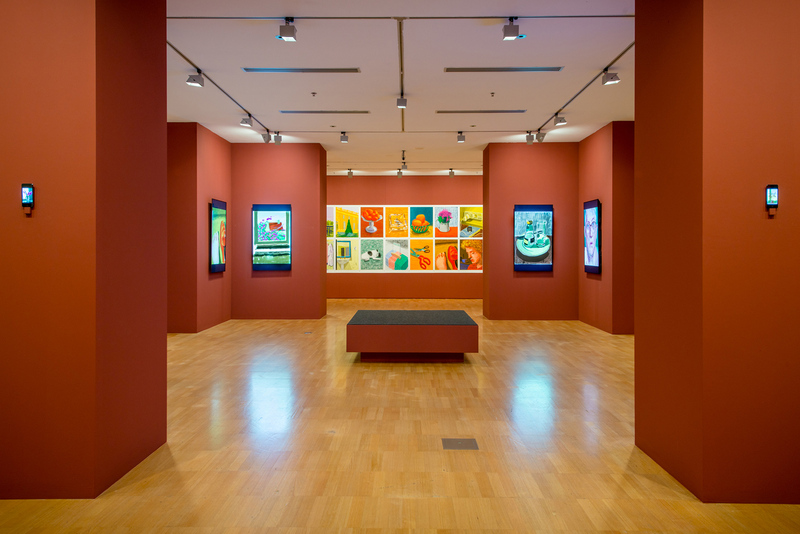 Hockney remains unabashed by his use of technology for a lot of this show, with this room displaying it’s particular advantages. Autumn turns to Spring, as the darkened tones are replaced with blinding colour, as each piece stands with vivid growth, due to it’s presentation and natural harmony. Despite showing minor shortcomings, this selection of larger works lack the texture and flow of oil on canvas, yet the flat window-like scenery provides a seamless interaction with it’s viewers and the folklore of time. A hall of portraits stretches alongside the room with the traditional use of oil takes centre stage in over 50 pieces, contrasting with what lies on the other side. 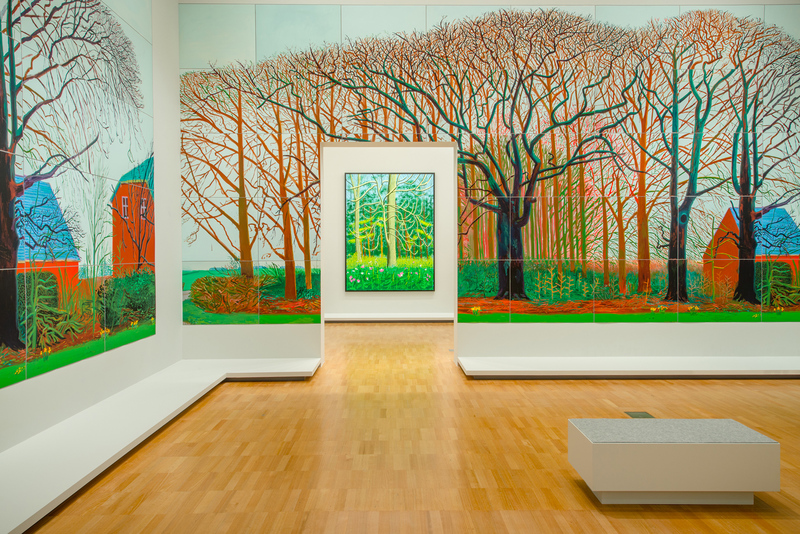 As diverse as this may seem, Hockney seems to find a beauty in the relationship between people and nature, as their similarities in life’s purpose and passing provide a similar theme, interacting and moving with each other at each shared moment. Moving toward the fourth chapter of this exciting exhibition, we are presented with a selection of multi-formats in photo and video work, across the final 3 rooms. 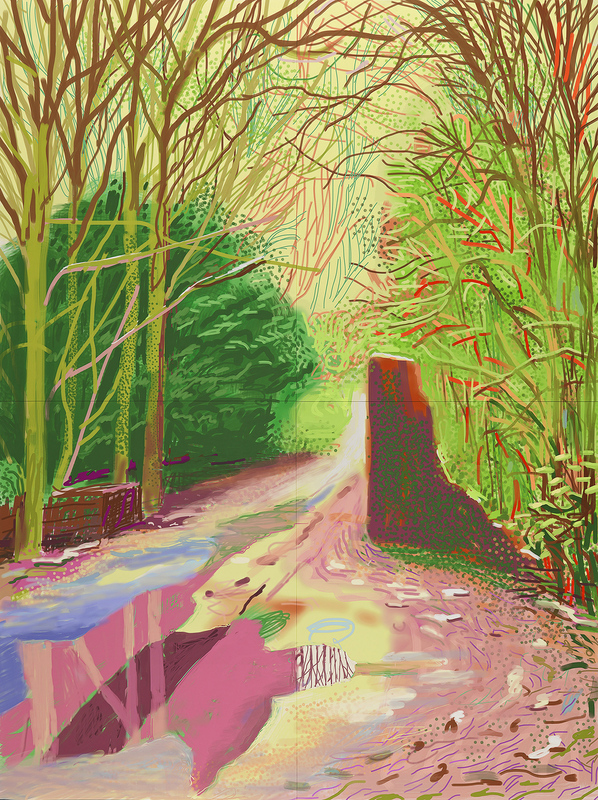 Mostly void of the still-life environments and people presented in most of his work, we are presented with a disjointed Hockney as he replicates the feverish fantasy evoked from a mind still brimming with creativity, as his subjects: play, succeed, fail and recoil with their remedial tasks, all in a balanced succession. Encompassing everything that came before, these final pieces are unfamiliar in execution, but share the same passage of momentary illusion with each passing piece. Time is always of the essence here, no matter what you decide to do, you just need to find where your myth leads you. 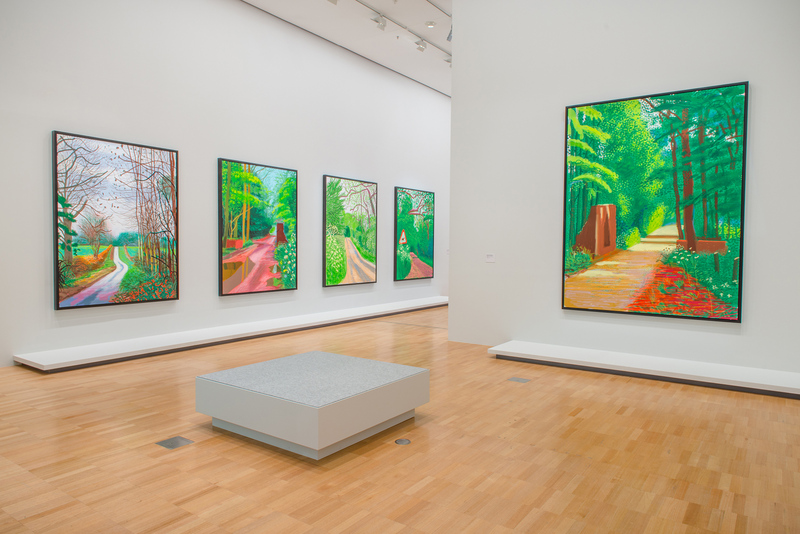 Closing with a slow passed detachment of screens, drifting into the four seasons that travel Earth, Hockney ends on a fragmented view of his journey, allowing you to follow whichever course you see fit. Exploring themes of time, age and space, Current is an alluring display of one of this worlds most natural painters, as he wields multiple formats to create a collection of work that looks different at each turn, but communicates a common stream at each thought. 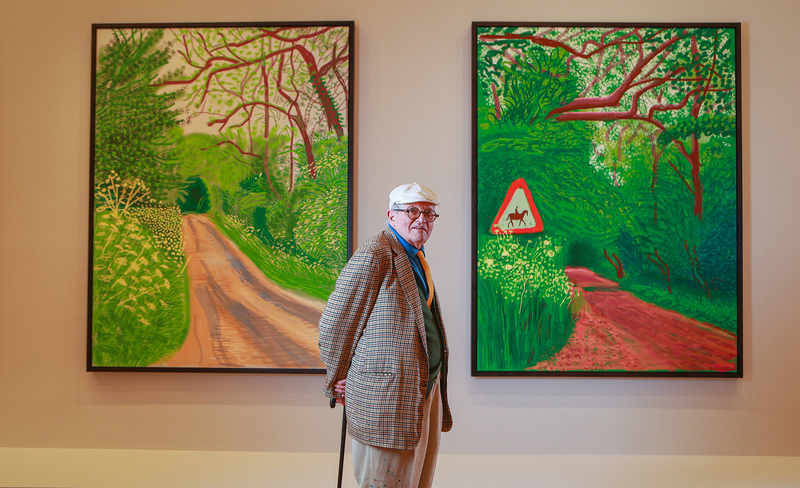 Despite his maturity, Hockney’s energy shines through with each piece put together, reminding us that age and perceptions shouldn’t slow the flow of time down, only what we do on each day presented to us. Everything on display here has an expiration, from the phone technology, the techniques put to paint and the artist creating them, yet we still stand here and appreciate the notion that we are alive in such a time to appreciate them. 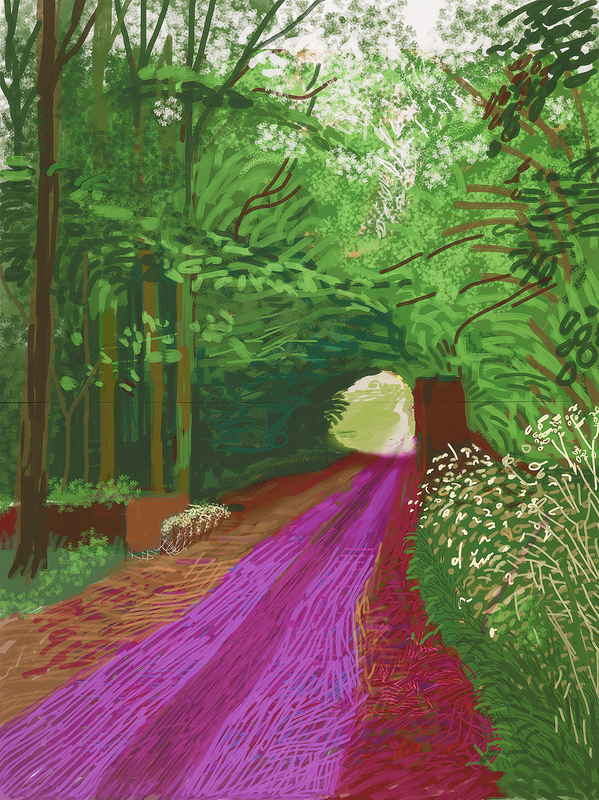 The work of David Hockney has and will be appreciated for many years to come, but his universal appeal doesn’t solely come from the stroke of his brush, it also extracts an energy of life, measured only by a comforting approach to experiencing it all at your own willing, allowing us to appreciate a life in art. 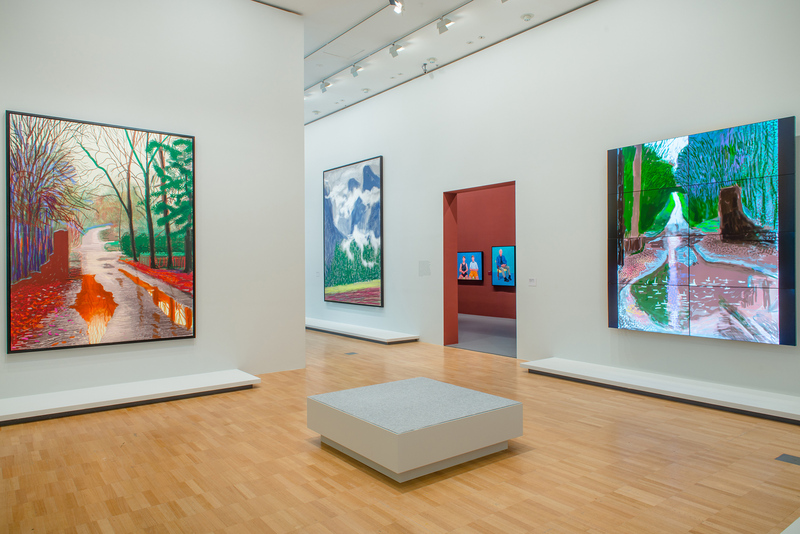 David Hockney’s ‘Current’ is on display now, until March 13 at The National Gallery of Victoria. All images kindly provided by The NGV.